This is a real simple project to get started on. Partly inspired from Alasdair Allan‘s work in the book Distributed Network Data. While the book concentrates on Adrunio I’m also interested in sensors from the Raspberry Pi side of things because the likes of storage and network is already there. So, what I’m aiming to do is to wire up a basic passive infrared (PIR) motion detector to the Pi and with Python have it tell us when movement is detected. That’s easy enough. Broadcasting to the world, easy enough but I’m not really sure that all of Twitter really needs to know when there’s movement detected in your house, it’s the first step to being unfollowed. To make this useful though I’ll make it send an SMS message direct to the phone instead. Then I’ll know when I’m being broken in to. Pin 2 – 5v is connected to the red rail of the breadboard. Pin 6 – Gnd is connected to the black rail of the breadboard. Pin 26 – GPIO 7 is connected to my row 30/a of the breadboard. 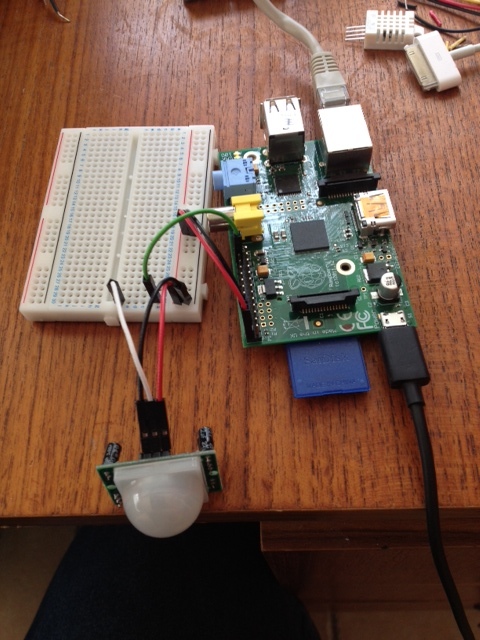 The PIR motion sensor is connected very similar with the 5v going to the red rail, Gnd going to the black rail and the output pin (to trigger motion) is connected to 30/f on the breadboard (the same line as the GPIO7 pin from the Pi. As hardware goes, we’re done. The rest is software. The basic code has been based on the work that Matt Hawkins has done, no point reinventing the wheel on this one. 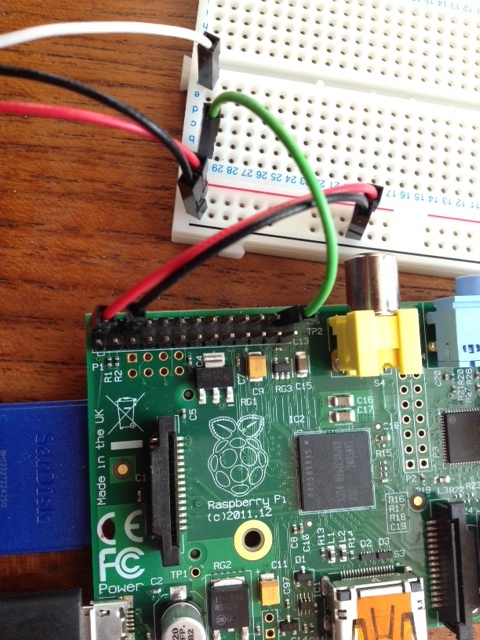 Using the RPi.GPIO library in Python he gets the basic PIR sensor talking to the Pi. You can see Matt’s original blog post here. Firstly I’ve added a method that will send a text message to the TextLocal service. 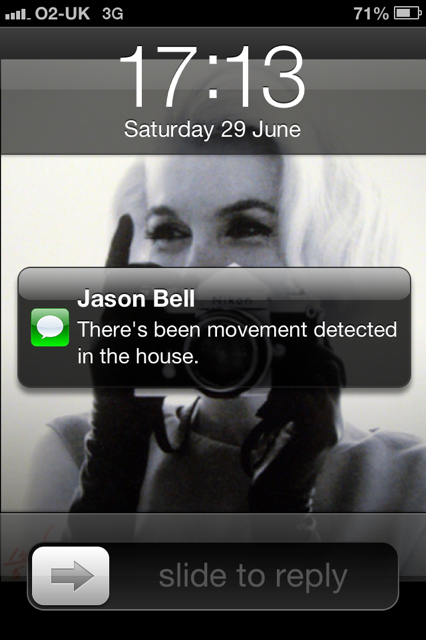 What we want to do is send an SMS message to a predefined number when the motion sensor is triggered. Basically the sendSMS method expects the arguments of username, password, recipient number, sender’s number and the message you want to send. This is then sent as a URL POST request to the textlocal.com server. You’ll need an account and credits setup first before you can try this out. Remember that SMS costs money. You’ll need to run this as the root user so Python can access the GPIO pins. I’ve stayed silent for too long, I don’t think I can actually take much more. While I find the informative and nigh on daily go-to site of “Arlene Foster Holding Things” it does graphically show what’s wrong with PR photos in Northern Ireland, they are boring as ****. A quick look at SyncNI and it’s ream upon ream of folk staring at camera while holding an iPad/Bit(s) of cardboard or worse still, Polystyrene letters. As the first port of call it shows a complete lack of creativity and this is projected out to the world (and yes I mean the world, this is the internet after all). Now I understand the photographer’s need to be in and out in fifteen minutes and the pay scale is rubbish but there seriously needs some imagination from the organisation who’s getting photographed, the photographer and the marketing company. I’ll go as far as saying that there aren’t many that can do it well. It’s a rare talent to tell a cohesive story through a photograph. NI creatives, is copy/story/photograph well it’s time to your games. So companies, have a really good think about the message you want to convey. The photographer is there to take photograph and not to be your marketing and creative department. And photographers, the straight in and straight out photograph no longer applies. You’re only letting yourselves down shooting on program mode with no thought for light. Give me narrative, give me a story and a picture to remember….. here’s your starter for 10. Go study Wired. 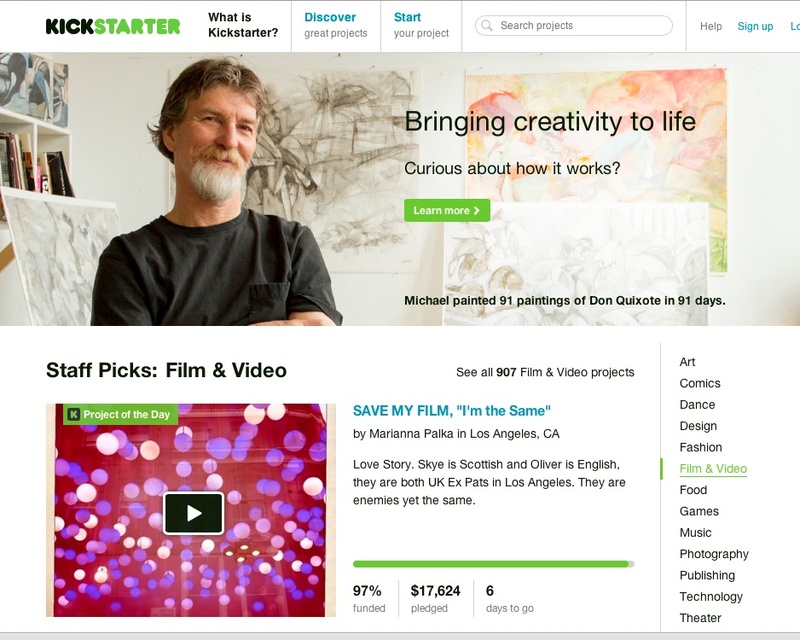 The concept of Kickstarter isn’t new and I’m happy to say that it’s launched thousands of dreams and probably deflated a few as well. As with these sorts of things it got me thinking about what makes stuff fundable in this sort of realm. Especially when it comes to Northern Ireland projects because that’s where I am. More so what got me thinking was seeing the pitch for the Sugar Supper Club in Newry. A brilliant idea and one that I’d love to see funded but it got me thinking some very fundamental questions. Where are your potential customers/backers? For bricks and mortar stores, restaurants and anything that requires footfall then this is the first obvious question. And I wonder if it’s the reason this sort of thing struggles to get funded. Theatre productions fall foul on this point as well. We need to work on the theory that a percentage of the local population will fund and dine. Newry’s population was as of 2010 27,575 and this becomes important when we start talking percentages of population who will back. I’m starting with 2% as a figure so that’s 515 people would could potentially back this project. This doesn’t count people out of town, people who like to fund projects for their own happiness regardless if they ever go to the end product or now. These things can’t be discounted but with a bricks and mortar project it’s probably unlikely because…..
A gadget usually does well, just look at the 3D Doodler Pen or the Pebble Watch. Products do well if they fulfil a need. And with worldwide shipping for the initial project then the audience is wide open compared to a bricks and mortar project, therefore the probability of successful funding is raised. How much is to be raised? Too little and it might look like a credible product, too much and many won’t take the risk. I want to get more data on this but I get the sneaking suspicion that projects looking for less than £/$10,000 seem to make the grade in having a good chance of being funded. Okay it’s my rule but I think it’s valid. 65% of the funding has to be raised in 35% of the time of the funding period. So 65% of £12,500 is £8125. The question is can it be raised in ten and a half days. The rest is a long tail and also a psychological ticker on potential backers from that point on. “If they’ve put money against it so quick it must be good”. The first 35% is when the hard hitting marketing has to be done (Facebook, Twitter, begging letters and all that jazz). After that it’s common sense. Is the project owner in that sector? Do they have a decent track record? Have any other projects been funded and completed. I’m off to have a look at some data, have a play and come up with a barebones algorithm. In the meantime go and fund the Sugar Supper Club, the food looks lovely. 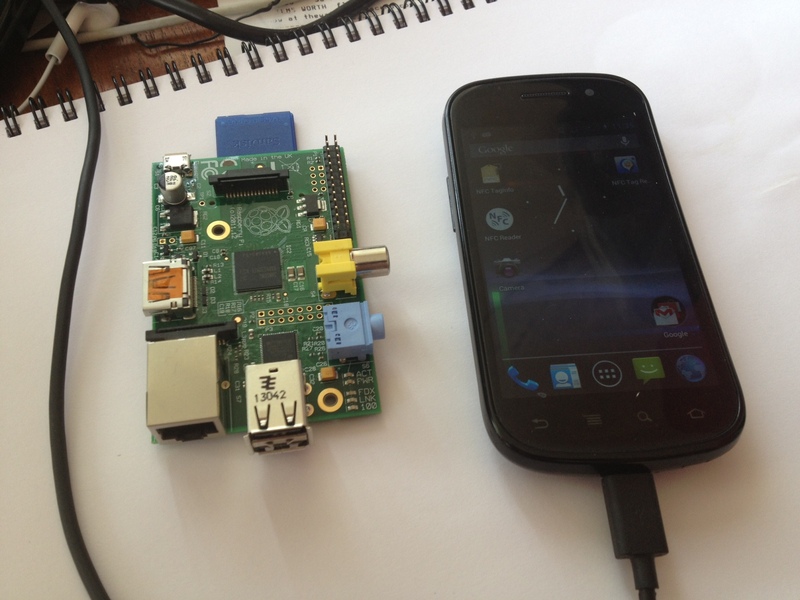 Pi, Bluetooth, R and Twitter…. gotta be fun in here somewhere. Yup I found it. Scan and tell who’s discoverable. 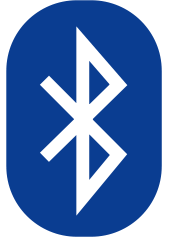 No use whatsoever to the outside world (that I’m aware of) but the basis of some funky retail marketing startup who think Bluetooth might be the way forward. First of all if you haven’t got a Bluetooth dongle get yourselves to Tesco and buy their little Technik nano bluetooth dongle for a fiver. Works a treat. Have a couple of games of Mario Kart or make a drink while it installs. Could take a while. If you were reading the Pi Twitter Sentiment Server posts then you’ll have all this set up. If not you can read it here. One thing you need to do is make sure your Twitter developer app can read/write to Twitter. And it will produce a list of the MAC address and the name of the device. We can run within R…. The strsplit command will give you a two dimensional vector with three elements: space, MAC address and the discoverable name. So [] means give me value of the second row and third column of the vector. Plenty of scope from here to save the MAC addresses to a datastore so the same names don’t keep appearing everytime the scan happens. Also if you read back on previous posts you’ll see it’s easy to knock up a cron job to run this every ten minutes or so. It looks like the hcitool caches the scan for at least 30 seconds so there’s no use pounding the scanning for new devices for any duration less than that. Random samples from R data frames. There are times you just have too much data, random samples are nice to test assumptions and algorithms first. So in R you can create a function to return a random sample of a data frame for such emergencies. (40 being the number of rows you want in your sample). This is my dear friend Frankie. He’s not a data scientist (that I’m aware of), nor is he a programmer (that I’m aware of) but looking back over the years this is the man who taught me the art of prediction with data. We worked together in a record shop and his knowledge is encyclopaedic. 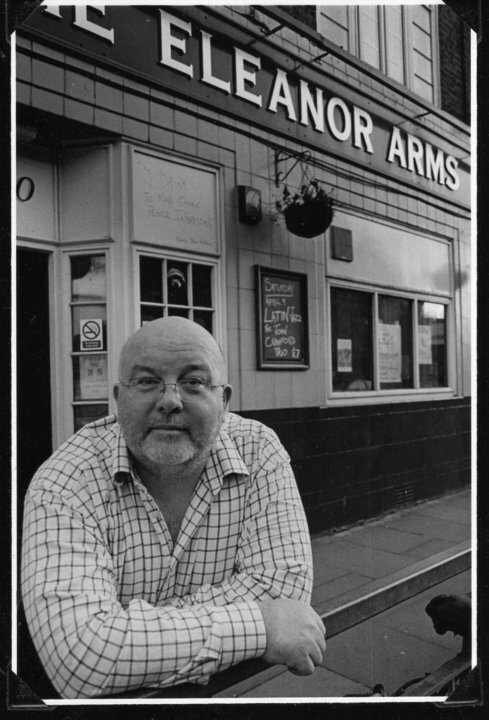 Anyone who has visited the Eleanor Arms will see from the CD collection for the Minestrone Of Sound. So from late 1991 – 1995 I learned the art of working in a record shop. Key objective, don’t get lumped with stock you’ll never sell especially when it with CD singles. Knowledge takes time but you can monitor and sense what’s going on in a Nate Silver kinda way, if you can see the patterns of the past that sort of gives you a sense for the next week, two weeks at a push. It’s not rocket science. Each CD had a card and it listed the date and quantity of that product that came in. From that card, watching shoppers and generally sense what was playing on the radio (and the record company reps coming in) we built up the order. This vital data drives your order, to few and customers will go elsewhere and buy, too many and you’re left with an overstock when the record dips out of the top ten. Once a record dives, it dives quick. Remember we weren’t dealing with computers or multiple POS reporting. This was all done by hand with a large doses of head, heart and gut reaction. He also taught me how to tune the shopping area to the type of customer who was in. Slap a Daniel O’Donnell CD when you see a bus tour past, it does not fail. Stick it a on video wall and it was one of the most strangest sights I’ve ever seen. Like cinema there were numerous new products coming out every week so what to choose, what to get a couple of and what to ignore is truly an art. Frankie taught me and I learned the hard way but he was gracious enough to give room to make the odd mistake. Fact of life it’s going to happen. The long hours during Christmas, the odd customers, I’m still asked to recall stories of working in a record shop, I loved it. He also introduced me to the music of Curtis Magee….. but I think that’s another story for another day. Big data, small Data, it’s all data. When we think of Hadoop we think of huge clusters of machines, in a data centre somewhere dimming the lights of the cities they reside in, meanwhile data is being consumed, mined with the hope one day that sense will come out of it. Take a look at your desk…. Now take a look at your desk, now I can’t vouch for everyone but I’m going to take a rough guess, there’s a phone or two. Perhaps a tablet, a Kindle maybes even a Raspberry Pi. Everything that’s connected is a node. Every device has some form of identification therefore it can be registered against a service of some form to know that it’s state is either idle or doing something. I’m thinking about all that time the Nexus S is sat on my desk doing nothing when it could be doing something useful, processing data. Android being a good candidate for downtime processing as it can handle background tasks pretty well. What if I said there IS a cure for……? We’ve just not found it yet. Harking back to screensaver programs of old that did computations during the idle times (yes it has been done before), why not have the idle device work in the background pulling, processing and returning results back to a central server? Registered devices get paid for processing the data. Think about it, a medical research firm could leave data with the main system and in turn farms out small segments of data for processing on connected and idle devices. Makes perfect sense to me considering that devices sit on our desks a lot of time on charge, while you’re asleep or working at your desk. Moore’s Law gives us the knowledge and foresight to know the power that these devices will have in the future. Hadoop in your pocket is not far off (hopefully someone will port to iOS at some point, it has to be done). It doesn’t really matter whether the data is big or small, while marketers will push the Big Data paradigm and how many billions it will potentially generate by 2017 or whatever there’s still a small matter of what can be done now. Map/Reduce does have a significant role to play in processing health data in my opinion. But I also think there’s a plethora of devices not used to their full potential that, with the right code, just be able to do the job and send the results back. I’m finding R more and more useful for just dragging data out of things. RSS data is a touchy subject with some, I still use it a lot and built Curatic to get me the stories I want to read, not lists of stories I don’t. Anyway, that’s not the point of this post. R and XPath, good friends. Pull and RSS feed and get the titles, descriptions and the publication dates quickly.